DeLisha Milton-Jones enters her 18th season in the WNBA this year. 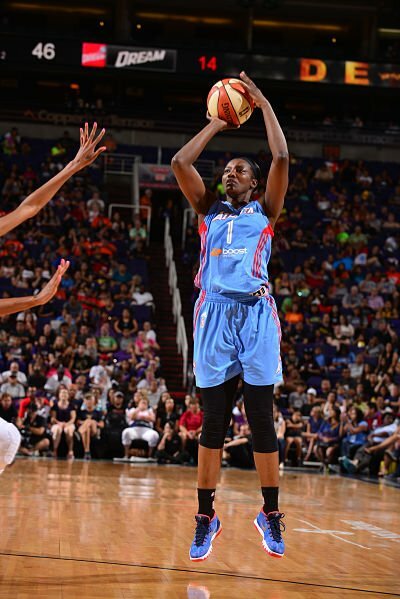 Photo by Barry Gossage/NBAE via Getty Images, courtesy of the Atlanta Dream. DeLisha Milton-Jones is a two-time WNBA champion and a two-time Olympic gold medalist who enters her 18th WNBA season in 2016. Last year she became the league’s all-time games-played leader, and is the most veteran athlete at 41 years of age. Milton-Jones is well-known for her sweet smile and bubbly personality, as well as her tenacious defense. Going into her first preseason game with the Atlanta Dream today, she was feeling a combination of excitement and nervousness. She played her college basketball at the University of Florida from 1993-1997 under coach Carol Ross. In 1997, she was named SEC Women’s Basketball Player of the Year and was the State Farm Wade Trophy recipient. The 6-1 Riceboro, Georgia native was selected fourth overall in the 1999 draft by the Los Angeles Sparks. She completed two stints there, from 1999-2004 and from 2008-2012, and has also played for the Washington Mystics (2005-2007), the San Antonio Stars (2013), the New York Liberty (2013-2014), and most recently, the Atlanta Dream (2014-present). Milton-Jones is excited to be back playing in her home state. However, Atlanta hasn’t been her favorite city in which to play. Milton-Jones said her love for the game has increased over the years, and she is smarter in game situations than when she was younger. “I only worry abut what I can control, and that’s my attitude and effort,” she said. She is also pleased at how the league has grown since it began. Milton-Jones has a few ideas to grow the league. Despite being ranked in the top five in both rebounds and steals, in the top ten for points, twelfth all time in blocks, and just one of five players with at least 5,000 points and 2,400 rebounds in her career, Milton-Jones was not named to the WNBA All-Decade Team in 2006 nor to the WNBA’s Top 15 Players of All Time, selected in 2011. Her numbers and accomplishments clearly qualify to be placed on either one or both of the lists. Milton-Jones is excited to see where the WNBA is headed under new president Lisa Borders, an Atlanta native who helped bring the Dream to the city. Serving as an ambassador for young athletes as a WNBA player, she feels she holds certain obligations. Not only can Milton-Jones play basketball, she can coach basketball. In 2005, she coached the professional men’s basketball team, the Los Angeles Stars, where her husband Roland was playing at the time. And with her WNBA career winding down, Milton-Jones could see herself reenter the coaching field. “I can see myself coaching on any level from collegiate to the professional- men or women. Commentating is something I would also love to do,” she said. Basketball has shown Milton-Jones much about life. The Dream tip off their season May 14 against the San Antonio Stars.